The Fitnex T60 treadmill is a feature rich, light commercial grade treadmill that will meet your workout needs. This treadmill will aid you in your quest to loose weight, get in shape or stay healthy. With this high quality treadmill you will be able to workout in the privacy of your own home without having to worry about the weather or travel to a gym. Features of the Fitnex T60 includes an adjustable 0-15 percent incline and variable speeds from 0.5 to 10 mph. By combining these features you can have some nice variations in your workouts. The built in exercise programs are 3 walking courses, 3 running courses, 3 cardio workouts, 3 fat burn programs, 3 interval workouts, 3 endurance courses, a heart rate control program and 2 custom learn programs. SKU: FMI-T60 Categories: Fitnex, Treadmills Tags: exercise, fitness, fitnex, gym equipment, treadmill Brands: Fitnex. 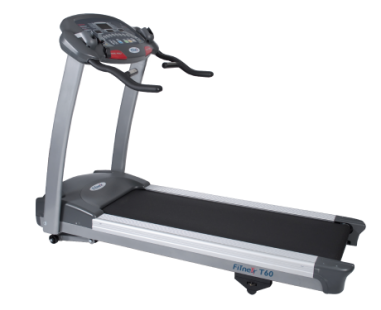 The Fitnex T60 provides an affordable, high quality treadmill with all the features you need to have a versatile workout. This product is built to last. It can be used in your home or in a light commercial setting. The T60 treadmill give you the ability to go for a nice walk in the comfort of you own home or jump on and get some serious cardio exercise. The built in programs give you a great diversity of workouts especially with the added feature of incline adustments for an uphill workout. Console: The main display is a profile matrix LED display. Below that are 3-window LED Displays. Console feedback from the displays include elevation, heart rate, time, calories, speed and distance. Included workout programs: 22 Manual, 3 walking courses, 3 running courses, 3 cardio, 3 Fatburn, 3 endurance, 3 interval, heart rate control and 2 custom learn. Power standard 110 volts 60 Hz. Motor: 3.0 hp continuous duty. Machine specification: Run belt (running space) 19.5″ x 60″, Rollers 2.5″, motor control-PWM System, 700 ft.lbs thrust motor, cushioning 8 point Elastomer system. Speed can be adjusted from 0.5 to 10 mph. Be the first to review “Fitnex T60 Treadmill with Adjustable Incline” Click here to cancel reply.